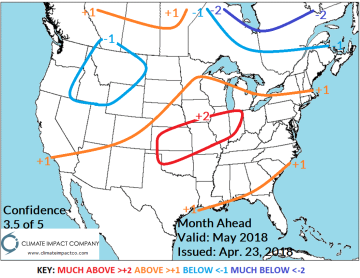 MAY 2018: The May 2018 Outlook is adjusted warmer. Snow cover finally retreats northward and the prevailing storm track also shifts north after a southern displacement during early spring. A warm push from the expansive warm SSTA pattern in the southeast North Pacific fuels warm surges into the Central U.S. causing a warmer change and also a wetter adjustment for thunderstorms for the Eastern Corn Belt to the Upper Midwest. The Northeast is adjusted warmer while the Southeast States are adjusted slightly cooler and wetter. Another forecast change is a drier scenario for the coastal Northwest. Fig. 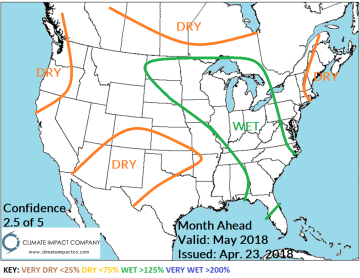 1-2: The Climate Impact Company May 2018 temperature and precipitation anomaly outlook for the U.S. is revised warmer from last week’s forecast. JUNE 2018: The June 2018 forecast is affected by two climate factors. Persistence of a storm track between Canadian cool and warm U.S. climate causing rains from the North-Central U.S. to New England and an emerging subtropical fetch of moisture into the Southeast. In-between the 2 wet zones dryness prevails. 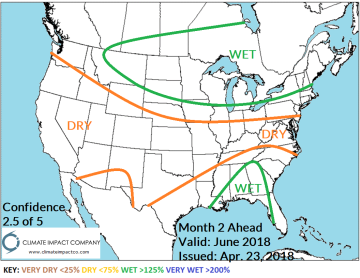 The West is also drier than normal. The temperature outlook is warmer especially across the Southwest Great Plains drought area. Fig. 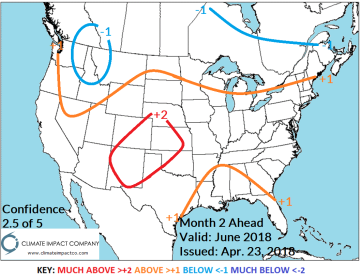 3-4: The Climate Impact Company June 2018 temperature and precipitation anomaly outlook for the U.S. is revised slightly warmer especially South-Central U.S.